The Macallan brand is world renowned and recognised as one of the finest scotch whiskeys. Up until 2004, the Macallan range was dominated by the Sherry Oak range, matured in specially commissioned ex-Sherry casks from Jerez in Spain. Quality in every detail and in every stage of the process is emphasised with the brand. The point of quality is further emphasised with their cuts which are reputed to be as little as 16% making it to the casks. Macallan insists on natural colour, so nothing added. In 2004 the Edrington Group influenced the addition of a new range - the Fine Oak range, through the introduction of American ex-bourbon Oak casks. 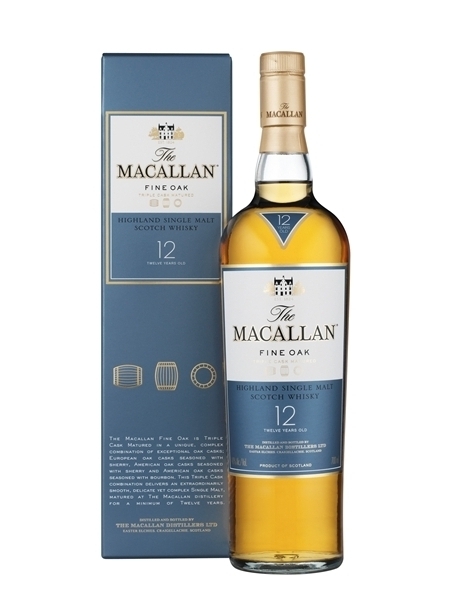 Macallan Fine Oak 12 year old (~€100) is bottled at 40% ABV.